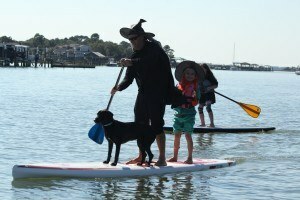 SUP Safaris hosted their Third Annual Super Scary SUP race at Folly Beach on October 26. Standup paddleboarders came dressed in full Halloween gear and ready to race on a chilly Saturday morning. Participants dressed Pocahontas, Indian Jones, cats, witches, and a pimp all to raise money for a great cause. Jon Ory, owner of SUP Safaris organized The Super Scary SUP race to raise funds for Salty Kidz–a local non-profit dedicated to helping underprivileged kids enjoy nature by participating in water sports including kayaking, surfing, and standup paddleboarding as well as trips to the beach. The race began at the Folly Beach Boat Landing where 40 elite and recreational SUP participants put their paddleboards in the water. Since this was only my second time paddleboarding, it took me a minute to stand up on the paddleboard. Once I had my balance, I slowly paddled over to the start line only to drift in the opposite direction of the race. As the elite racers took off to paddle a 10k race, the 5k recreational racers paddled toward the start. For the full costume race effect, imagine looking over to see a guy in full Indiana Jones costume with combat boots on a paddleboard while everyone else was barefoot. Once Ory began the countdown for the recreational race, again, I was no where close to the starting line. I slowly made my way towards the other participants as they took off. As I lost sight of everyone, I relaxed and enjoyed standing above the water with a view of boats, the beautiful houses that dot the waterway, and the breath taking views of the Folly River. I glanced over and then couldnt stop laughing as I saw fellow a fellow racer dressed as Pocahontas trying to paddle faster, too. Ory was monitoring the racers from a boat and drove up and gave us a quick paddle lesson. Once we got the hang of our new paddle strategy, our race became much smoother. Half way through the race, an elite racer passed us. This is my second time around, she called out as we watched her speed away. Just as I could see the finish line in the far distance, two dolphins popped up 10 feet in front of me. I stopped racing, took my paddle out of the water, and remained still as I saw the dolphins swim in front of my board. I saw the dolphins eyes as they swam past me. Nearing the finish line, a few of us encountered large wakes from boats speeding through the water. While we battled more than one huge wake, none of the SUP racers ever fell into the water. As we neared the finish line, all of the paddlers that completed the race and the SUP Safaris crew were waiting and cheering on all of the race participants. After all of the racers were finished, participants in the kid and dog race carefully climbed onto their paddleboards. Kids, dogs, dog owners, and parents paddled over to the starting line as a few dogs jumped into the water. One racer jumped off his board into the water, put his dog back on his paddleboard, and then climbed onto his paddleboard. The crowd on the dock was impressed with the paddlers balancing skills after the racer climbed back onto his board without knocking his dog back into the water. The kid and dog racers paddled a short distance through the marina and back to the Folly Beach Boat Landing. The most impressive racer was dressed in full witch costume, with his daughter dressed in costume sitting on the back of his board, and his dog sitting on the front. Racers and their dogs paddled happily through the marina. When the race was over, all of the participants returned to SUP Safaris for an impressive raffle, silent auction, and race prizes. Ory handed out super scary trophies to the Super Scary SUP race winners. Skulls, creepy tribal figures, and voodoo themed trophies were given to the 3rd through 1st place winners in the mens, womens, and childrens category. Some of the winners received some generous prizes like rash guards, gift certificates, and a SUP paddle. Following the awards ceremony, Ory began raffling calling winning raffle numbers. Ory told us, $3,000 worth of prizes were donated by folly beach businesses. Raffle prizes included $25 certificates to Surf Bar, Lost Dog Cafe, and Ritas Seaside Grille. Clothing, more gift certificates to Folly Beach businesses, and sports gear were also raffled off. The prizes for the raffle seemed endless as nearly everyone won a prize and many participants won several prizes. SUP racers also participated in the silent auction bidding on sun glasses, restaurant gift certificates, and vacation packages. Ory thanked the crowd, and Daniel Yost, President of Salt Kidz, also thanked everyone who participated for helping raise money for his newly developed non-profit. We caught up with Yost after the race. We are so grateful for the support from Jon at SUP Safaris, and his generosity has allowed Salt Kidz to have some incredible opportunities, he said. Yost told us that Salty Kidz has also worked with My Sisters House, a local non profit that provides housing to victims of domestic violence and their children. Salty Kidz took 6 outings with kids from My Sisters House over the summer. Some of these kids live here and had never seen the ocean, Yost said as he talked about a Salty Kidz beach trip. After the event ended, race participants walked over to Surf Bar where the generous staff provided us with free post race food. Wings, fries, hummus, BBQ, cole slaw, veggies, and onion rings were just some of the foods that were brought to us until we were stuffed. I ate 4 different types of wings and loads of delicious grub, and the friendly staff provided excellent service to the Super Scary SUP crowd. Ory, the Super Scary SUP race participants, and the silent auction raked in $1,010 for Salty Kidz. Ory was thrilled, and hes looking forward to the St. Patricks Day SUP race as well as planning next years Super Scary SUP race. The generosity of the Folly Beach businesses and SUP participants truly made this a spectacular event. For more information about Salty Kidz visit: http://danielyost0.wix.com/saltykidz.